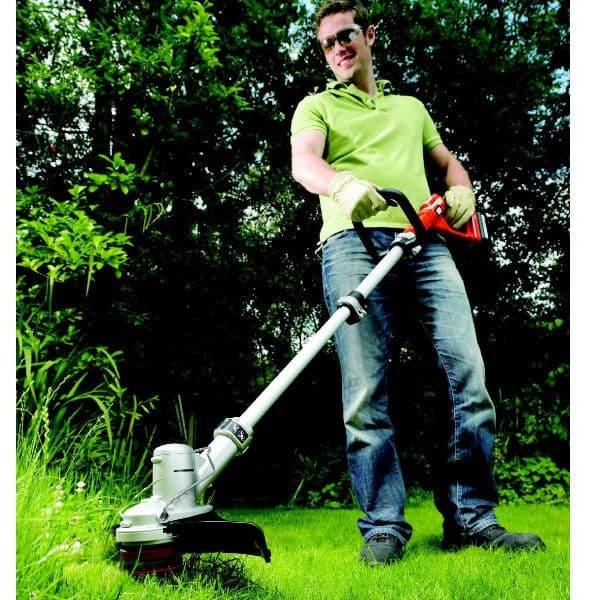 It's time to loose that power cord or noisy petrol engine and consider a low maintenance cordless strimmer. We compare features, build quality and run time to see how they stack up against each other. Commonly known as line strimmers, there are three types of garden strimmer, the most budget friendly type are corded strimmers, these are usually cheaper but you're tied down by the power cord getting under your feet and they are not suitable for larger gardens or gardens where there is no plug socket. 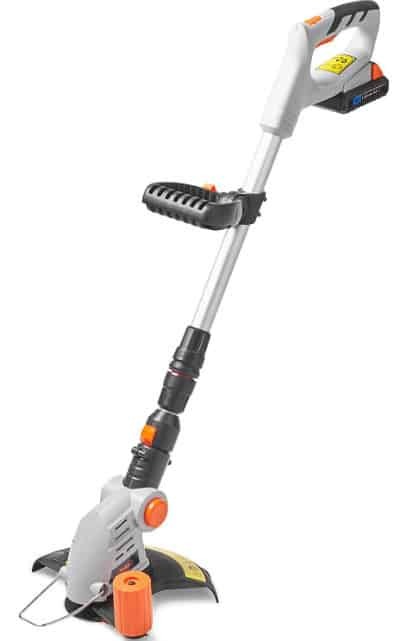 Then there are petrol strimmers that are powerful and great for longer grass and mobility as you don't need a power source and can be easily refuel, however these can be both heavy, noisy and require more maintenance, so are not suitable for everyone and are usually used by professional gardeners. Finally, one of the most versatile and best types are cordless strimmers powered batteries, thanks to new battery technology, cordless strimmers are now some of the best strimmers available. These newer models are powered by Lithium-ion batteries, we have covered these before when reviewing cordless hedge trimmers and lawn mowers, in general they have longer running time, much shorter charging times. Cordless strimmers range in price from around £80 for a good entry level model for smaller gardens to over £200 for models suitable for larger gardens and capable of intensive strimming of long grass, brushwood and overgrown weeds. Before we get into our reviews and top picks, we would like to high light our 'Best Pick' which is the Black + Decker 36v Cordless Strimmer. 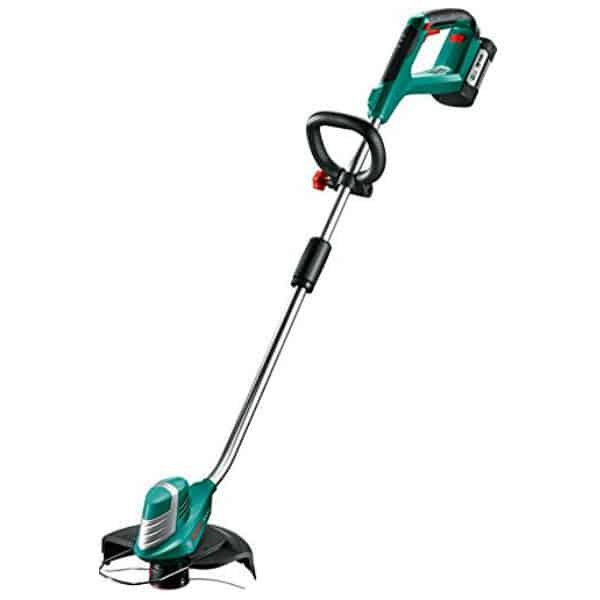 It's got to be one of best cordless strimmer for most gardeners as it offers excellent performance thanks to its powerful 36v battery, has a wider cutting width and comes with 2 years warranty. It really is that good! Cuts up to a staggering, 3750 linear meters from one charge. Power Select - lets you choose between 'Eco mode' and 'Turbo mode' for increased run time and optimum performance. The number one consideration will be 'what batteries do they use', this can be a little confusing to understand at first as they don't all use the same batteries and some models are available with different batteries, this can have a large impact on the price of the strimmer. Look for models powered by Lithium-ion batteries - They have longer run times, much shorter charge times, with many fully charged within 60 minutes and they do not loose their charge like other types of batteries do. TRY TO AVOID MODELS THAT ARE NOT POWERED BY LITHIUM-ION BATTERIES. We do recommend one model that is powered by a NiMH by Flymo but we made an exception for this model due to good rating and performance. Ideal for larger gardens and ideal for cutting longer grass even when wet. Powerful 18V 5.0Ah Lithium-ion battery for longer runs times. Long 30-40 minute run time and charges in only 70 minutes. 2 speed with variable control and incorporates a brushless motor for long life expectancy. Professional performance ideal for gardeners looking for a powerful alternative to petrol. 3 Years warranty when you register online for free. The best cordless strimmers are available with a range of different battery sizes, most cheaper models are powered by 12v lithium-ion battery, but these are less powerful, have shorter running times and are only really suitable for small gardens. There are also models which are powered by 18v, 24v and 36v batteries, these models have plenty of power, and are often comparable to main powered and petrol strimmer in terms of performance and power. If you look carefully at which battery they come with, they will state the 'voltage' (v), generally the higher the voltage the more powerful the strimmer will be. It will also states the 'Amp Hour' (Ah), they usually start are 1.3Ah and go up to around 4Ah, the higher the rating the longer the running time is. This is the main reason the price can vary so much between models which appear to be very simular. Generally the higher the voltage (v) and Amp Hour (Ah) the heavier the model will be, so sometimes more is not always better or even needed. It really comes down to what you plan to use it for and how long for. One of the main advantages to lithion-ion batteries is there ability to charge quickly, usually between around 1 hour and 3.5 hours depending on the battery. Unlike older batteries, lithium ion batteries can be recharged before they battery is flat, with the old Ni-can batteries, doing this damages the batteries but with new lithium batteries, this is not the case and they can be charged at any time, They can also hold their charge for long periods of time which means they can be stored over winter and will have a a full charge when you get it out after a long periods of time. This means no getting your strimmer out, only to find the battery has gone flat over winter which use to be a common event. If you have lots of strimming to do, consider buying a second battery when you buy your strimmer, as they are often cheaper than if you buy it separately at a later date. 25cm cutting path and adjustable cutting head, ideal for strimming in tight places and edging around lawns. Converts from strimmer to edger and mini mower. Incorporates two wheeled design for better stability whilst strimmer and edging. Comes with 2 x 20V 2.0Ah battery so you can use one battery whilst the other charges in only 60 minutes using the fast charger. Plant guard to protect plants and trees while strimming around them. The Black + Decker GLC 3630L20-GB cordless strimmer is powered by a powerful 36v 2Ah battery which provides enough power to strim up to 3750 linear metres from one charge. The battery can then be recharged in only 90 minutes, to get you back up and running again in no time. Fitted with Black + Decker, advanced E-drive technology which is a high-torque gear system that ensures it has enough power, and cutting speed of an impressive 8500rpm, which ensures it can cut through even the toughest of brushwood and weeds. Another feature fitted on this model is the 'Power Select Mode', you can simply switch between 'Eco mode' for lighter jobs such as strimming the edge of lawns and then select 'Turbo mode' for those tougher jobs where that little extra power is needed. This also helps improve the running time as your not using lots of power when its simply not needed. The ergonomic and light weight design, ensures is comfortable to use and to help reduce fatigue, it has a second handle to help distribute the weight evenly when in use. The primary handle is fitted with a rubber grip to ensure the strimmer is comfortable hold and does not slip when in use. It also features an adjustable telescopic handle so that the height can be set to suit the individual needs of the user. One final feature is the adjustable head which can be used for trimming the edge of lawns to keep them neat and tidy, with minimal effort. The video review below by Knoxieman on youtube explains the features and shows it in action, well worth a watch and explains why its worth investing in. Wide 30cm cutting width, ideal for small, medium and large gardens. The telescopic adjustable pole ensures it can be set to the correct height for the individual user. I have always found that Black + Decker tools are just average, and all though they have always been ok and did the job, I have never really been that impressed by Black + Decker. That is until we can across this Black + Decker 36v strimmer, to round it up, its absolutely superb and here why. First impressions were that it is very well made (one box ticked for quality). One of the real improvements I feel have made cordless strimmers a viable option for many gardens, is the new lithuim-ion batteries they are now powered by. Now some models are still under powered but Black + Decker have fitted this model with a 36v 2Ah battery, what this actually means is that it has plenty of power, but it also has an impressive running time. The running time was around 50 minutes in eco mode, which is great for most lighter jobs, such as strimming around trees and edging around the lawn and last around 30 minutes in 'turbo mode', which did a great job at cutting through tough brushwood such as nettles and long grass. The adjustable head, which tilts 180 degrees was great for cutting around the edges of the lawn and the telescopic handle was very useful, as it makes it very comfortable to use. Finally its not the lightest model but at 3.5kg I think its light enough for most gardeners to use comfortably. I would highly recommend this model, even if you have a larger gardens and have previously been put off buying a battery powered model in the past as it does have a decent running time, thanks to the high capacity battery. 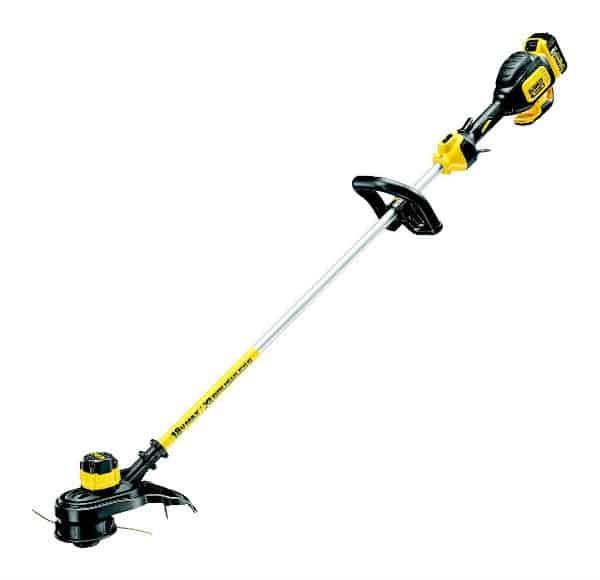 Overall a very well made strimmer, ideal for all sized gardens, for the price its certainly worth every penny and won't leave you disappointed. The VonHaus 20v Max Cordless Strimmer is powered by a 18v 1.5Ah lithium-ion battery which will give you around 30 minutes of running time. The battery can be recharged in only 60 minutes, so you don't need to wait long to get back strimming again. Unlike most strimmers that use a cutting line, this model used a unique sharp nylon cutting blade which has a 25cm cutting width. This gives a more efficient cut when compared to line strimmer models. Ideal for all types of strimming and trimming jobs around the garden, from strimming around paths, along fences or around the edges of borders and lawns. 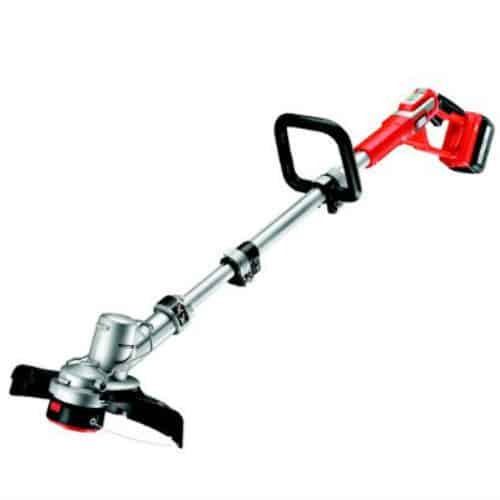 Other features include the 180° adjustable trimmer head that enables you to quickly switch to edging when trimming around the edges of lawns etc. A very versatile model, great for trimming in the tightest spots in the garden. It has a safety guard which is important as well as a plant guard to protect your plants when strimming around them, which is another useful feature. To ensure its well balanced and comfortable to use for all gardens, it has an adjustable telescopic handle which can be set between 850 - 1140mm, along with a ergonomic design, soft grip handle and light weight design. It comes complete with 10 blades (9 spare), more can be purchased if needed at a very affordable price and it comes complete with a 2 years manufactures warranty, for peace of mind. Telescopic adjustable pole (between 850 - 1140mm) ensures it can be set to the correct height for the individual user. We're a big fan of 'VonHaus garden tools' and have all ready reviewed their cordless hedge trimmer and cordless rotavator and they always impress, as well as being very reasonable prices. This strimmer is no different, and if you have a small garden, you want to keep it neat and tidy, this may be what your looking for. The telescopic handle is a great feature, specially for smaller gardeners as you can adjust the height to suit you. I was impressed with the nylon blade which works great when tidying around the garden, the adjustable head is another welcomed feature making trimming edges very easy. It should give around 30 minutes of strimming but we found that around 20 minutes was about right, even so this is probably more than enough for smaller gardens. Despite all our positive comments, we did find that it does struggle with tougher jobs. Because of this, we feel its best suited to keeping the garden neat and tidy every couple of weeks, rather than starting to cut down long grass and brush in gardens that have not been maintained for a long time. One concern we did have is we felt that the blades may need replacing on a regular basis, however it does have 9 spare blades and the replacement blades can be purchased in packs of 20 and are not expensive. You can see the replacement blades here. 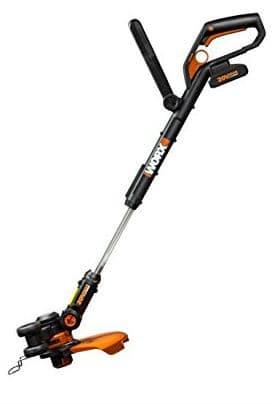 Overall an excellent entry level strimmer for maintaining the garden and at a price you would not expect. One other important point, it does come with 2 years warranty, which is great news as it shows the manufactures do back up the quality of there products. Plant guard to protect plants when strimming around them. Bosch are known for there quality garden tools and they manufacture a number of cordless strimmers and this Bosch ART 30-56 Li cordless strimmer is one of their larger heavy duty models, designed with large gardens in mind and for tougher strimming where less powered models may struggle. 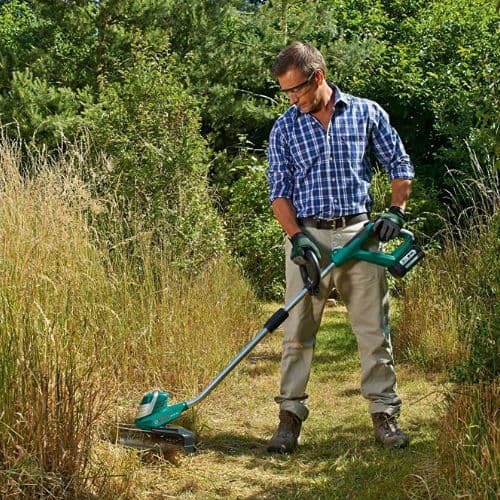 Powered by a 36c / 2.6Ah lithium-ion battery, it will easily cut through the toughest of brush and long grass in larger gardens. Like other Bosch models it uses a Bosch Syneon Chip which intelligently controls the energy and power required for the type of strimming your currently doing. At the cutting end, it uses a semi-auto feed twin line feature which gives it more cutting power as it has two cutting lines, unlike most other models that only have one. The ergonomic design and adjustable auxiliary handle ensure that its comfortable to use, even when used for longer periods of time. We have reviewed a few Bosch power tools including garden shredders, cordless lawnmowers, hedge cutters and they all way seem to impress and are always very well manufactured. We looked at a few different Bosch strimmers in the past and we have never been that impressed with them, however when we first seen the Bosch ART 30-36 Li strimmer we new that this was about to change. Its very well made, rock solid machine, its worth mentioning that its only really designed for strimming large gardens and will strim anything the you put in front of it, from tough brushwood to long grass. One great feature we do like is the plant protector, which means you can strim around plants without worrying about damaging them. As its only designed with strimming in mind it does lack a few features some gardeners might prefer. Firstly unlike most other models, it does not have an adjustable head which means you can not use it for edging. Another feature it does not have is a telescopic handle to adjust the height. Overall its a great strimmer, specially if you have a large garden and need a strimmer capable of strimming through tough brush and long grass, then this is probably one of the best models for the job. One charge last around 35 minutes which we found would be enough for most larger gardens and the battery can be recharged in 90 minutes. If you have a extra large garden or field to strim, it may be a good idea to invest in a spare battery. We actually started by looking at over 15 different cordless strimmers and it quickly become clear that lithion-ion batteries were the way to go, prices ranged from around £50 for a nice entry level model for small gardens, to well over £300 for a cordless model that was capable of strimming tough growth in larger garden. Which strimmer is best for you, will largely depend on what you intend to use it for and how much strimming you need to do. Our 'best pick' which we feel is suitable for nearly all strimming jobs whether it be, strimming a small garden or hacking back long grass and brushwood in a large garden, is the Black + Decker GLC 3630L20-GB cordless strimmer. It excels in nearly every way, from its light weight design and telescopic handle, to its robust design and adjustable head for strimming around edges of the lawn. Its really is a strimmer for all types of jobs. If you have a small garden and need a quality strimmer for light work such as strimming the edges around your lawn or strimming around paths and borders, then the VanHaus 20v Max cordless strimmer is the ideal candidate. Its the cheapest model on our list and offers excellent value for money. If you have a large garden or need strimmer to take on them tough jobs such as hacking back thick brushwood, thick weeds such as nettles or long grass then the Bosch 30-36 Li Cordless Strimmer is the best strimmer for the job. Plenty of power, very robust, the only real down side is that is does not have an adjustable head which means it can not be used for edging. The Black + Decker STC1820 was also a great model, slightly smaller than out 'best pick', but lighter and cheaper, but it still packed plenty of power and had a decent run time and fast charge time.